There’s a lot of detail that goes into association management. If you’re an association director or marketing executive, you know how important it is to build trusted business relationships with companies who can help you reach your goals. You value efficiency, the ability to solve problems, and creativity. Associations are a key market segment for Sphinx Business Solutions and we know how important it is to understand the specific programs that each of our clients undertake. From annual meetings and events to special membership services, we’ve worked with our association customers to create and implement products and systems that work. Annual Conference signage and registration packages for Georgia Forestry Association. 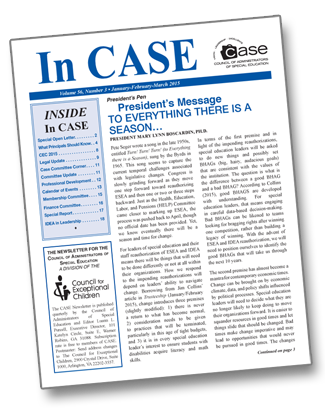 Monthly Newsletters for Council of Administrators of Special Education (CASE). Over the years, we’ve worked with our association clients on hundreds of projects to help them communicate with members and donors and in their legislative activities. We’ve put together a few examples on our Association Products and Services page. You may also want to download our Project Case Study (landing page link) to get an idea of how we work together with our clients to streamline project implementation. The pace of technological change is rapid and new channels of communications seem to appear almost daily. Sphinx Business Solutions began as a printing company and we’ll always love that business, but we’re also fascinated by the possibilities that technology brings. Printers have always been good at managing the details. Now we’re applying those skills to develop capabilities that will help our association clients integrate print, email, and online communications. Typically, associations use a combination of outside vendors, freelancers, and internal employees to create content and communicate via online channels – website, social media, email. Because the effort is spread out, there always seems to be a problem. Either coordination is lacking, implementation is too time consuming, or someone drops the ball. If you’ve found yourself in this situation, let’s talk about ways to manage the process, consolidate the effort, and make communication across multiple channels easier on your staff.